There are many proud Tylerites who love the Tyler Rose Garden while also thinking that it needs some work. It’s heralded as the largest municipal rose garden in the nation (impressive), but for some reason it just doesn’t do it for people. It doesn’t have pull. For the past few days I’ve been thinking about the garden and wondering what Tyler could change to make it a more desirable destination. When I drove there myself, I realized something: The Rose Garden can’t be significant on it’s own. While there are several components of “The Rose Garden Complex,” they don’t form a cohesive destination. They’re essentially separated from each other by roads and parking lots. As it is, this expanse of asphalt ruins what could be a really cool Rose Garden Complex experience. I wonder if Depave would be willing to help us take it out because it’s got to go. It does not draw you towards anything or direct you to go anywhere. Most of the parking lots don’t even have lines marking individual spots … it is truly formless space. If you look through the photo album at the end of this post, I think you’ll notice what I’m talking about. I was even impressed and I was expecting a lot of asphalt. I found myself thinking that we patterned our parking lot design after the ship harbor design. It might be because the huge Rose Festival floats need a place to sit and maneuver before starting the annual parade. While that may be the case, I think we can find some parking elsewhere in Tyler … their waiting area on one day of the year shouldn’t hold back the entire space. Besides, wouldn’t it be more fun to parade through a beautiful space? Fortunately for Tyler, a blank slate is a great place to start. My mind has wandered for hours these past few days and it finally arrived at the place pictured to the right. It looks like the Tyler Rose Garden Complex, but the center of the picture is grass (light green), trees (dark green dots), and rose bushes (dark green squiggly lines). And a water feature! (blue dot where the paths converge). In this place, the view from Harvey Hall is grand: Down a path bordered by trees, across a great lawn and toward the old fairgrounds and the Rose Garden. There is nothing but trees and grass between Harvy and the Rose Garden so that people can walk from one to another in the cool shade of trees. The Rose Garden itself hasn’t changed much except for the addition of an amphitheater (!) for live converts. (Big shout out to fellow visionary Tom Ramey and others for the idea of making the Rose Garden a music venue). “Live at the Rose Garden” is the hottest tagline in East Texas because (you guessed it) the backdrop to the concert is the largest municipal rose garden in the nation and for once there is something to do while you’re looking at it. 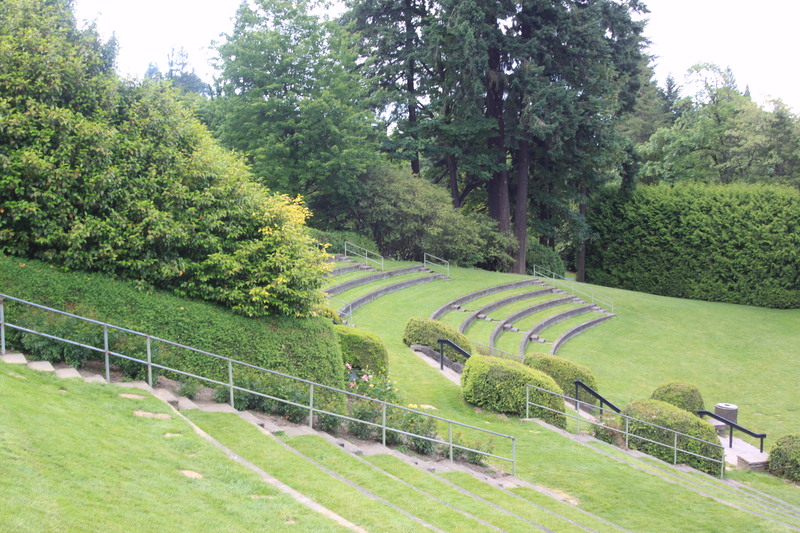 This amphitheater looks like the one from the Portland Rose Garden (to the right), but it’s better because it’s facing the flowers instead of big bushes. Every Friday night during the summer there’s a live concert here and people come from all over to fall in love with the place (and return again). When they arrive, they exit the street car at the stop just outside Harvey Hall on Front St. If they’re driving, they’re directed to park in one of the parking garages (PG) or lots (P) located on the perimeter of the complex. The roads within the complex also have on-street parking and handicapped spots closer to the center of the site. They all meet at the new roundabout in the middle. Once they’ve parked, they walk down a number of brick paths (red) or bike in the bike lanes along each street (black) to get to the amphitheater. Every Friday night during football season people come early before the games to walk to the lawn that is lit up with lights from the trees. The Rose Garden is even open on these game nights with special events to keep people in the area. All this visiting is great business for the bars and restaurants that opened up in the former fairgrounds buildings! That whole area was rezoned to allow mixed-use infill development so there’s even a small community of people living in apartments with a view of the lawn and garden. They go on walks down the brick paths and do stair runs up the amphitheater in the mornings to stay in shape. Whew! That place is so alive and engaging that people (even locals) don’t have to have a reason to visit. They just want to be there. Stay tuned for the next place my mind wanders to! 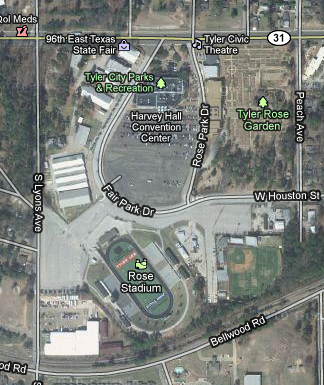 I’m thinking it might visit a place that’s more urban … in the meantime, enjoy these photos from the Tyler Rose Complex! It’s ripe for redevelopment. 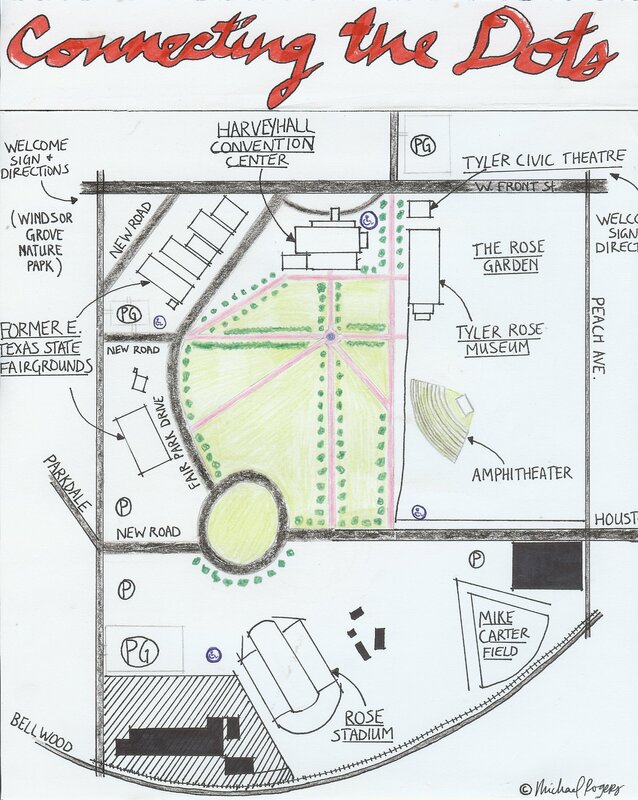 This entry was posted in Significance, Visons and tagged depave, node, Rose Garden, Tyler, Urbanism. Bookmark the permalink.